Call Michael Brotherton the Roger Ebert of science fiction movies. 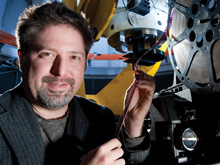 Known for his work relating to the study of supermassive black holes in the centers of galaxies, he also diligently pursues another passion: checking if the science is right in movies. An associate professor of astronomy at the University of Wyoming, Brotherton combines his love of science with his interest in science fiction. And he takes his science seriously. "A lot of people might watch a documentary on TV, or maybe they'll pick up a pop science book," Brotherton says. "But for most people, the only science they're going to get is going to be stealth education through entertainment. If it's consistently bad, I think that's a problem for our society. There are a lot of important scientific issues facing us." Brotherton practices what he preaches. He lectures at science fiction conventions, has published two science fiction novels — Star Dragon and Spider Star — and with the help of NASA and the National Science Foundation, instructs award-winning science fiction writers at the University of Wyoming every summer through a program called Launch Pad. He excels at educating his students in movie science and lending perspective to the importance of his cause. His concern about Hollywood's lack of "getting science right" is evident. Brotherton singles out the movie Armageddon for its erroneous portrayal of science. Although the movie won an Academy Award and is considered an exemplar of the genre, Brotherton points out that Armageddon averages a mistake every minute, and claims that NASA uses the movie as a test for potential mission directors. "The movie made a pile of money, but that doesn't change, or justify, the massive amounts of incorrect science," says Brotherton. "Most of the mistakes are scientific, and some of them are NASA-related procedural issues or other things." There is one movie for which Brotherton gives two thumbs up: 2001: A Space Odyssey. Also an Academy Award-winning movie, he reflects upon the director's ability to pitch a scientifically perfect game. "It gets everything right, including some complicated things," he says. His desire to spread the word about accuracy in movie science started in his graduate student days, when he first tried his hand at writing science fiction. Brotherton took it upon himself to make sure his science was accurate, so he demanded the same of the movies he watched. "Writing was something where I tried to put my love for science fiction and science together," he says. "I try to write some science fiction exploiting my special knowledge of what space is like and what different kinds of objects are in space — and some really cool possibilities." As an author and scientist, Brotherton is determined to continue educating the public about the importance of getting the science right in popular culture.